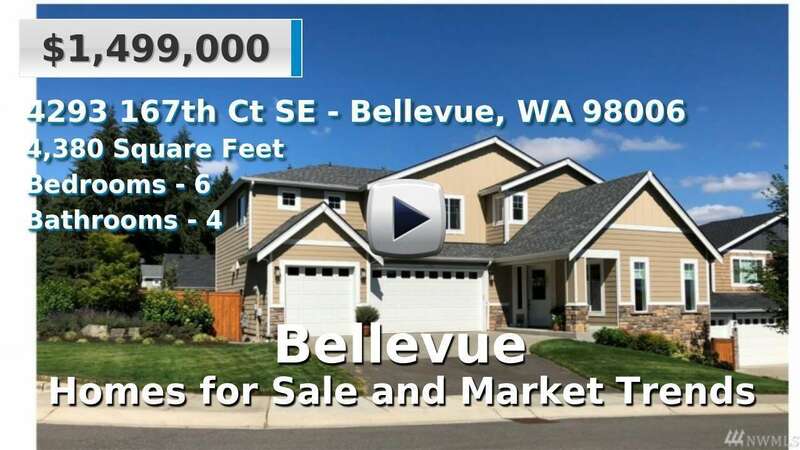 Bellevue is the fifth largest city in Washington with a population of 126,000 people. It is located in northern King County, across Lake Washington from Seattle. This area is mostly urban and suburban, in fact, it is Seattle’s largest and fastest growing suburb. People living in Bellevue don’t have to go far for whatever they need; the average commute time is just 21 minutes. It is a major business hub and home to many tech and commercial companies, but the ability to get out into nature isn’t far away, either. Day trips from Bellevue include mountain hiking and biking, watersports on Lake Washington, Lake Sammamish, or the Puget Sound, and visiting wine country in Woodinville or the Willamette Valley. Home buyers with an eye for NW Modern, Modern Contemporary or Custom Designs will find many choices in the Bellevue area and plenty with spectacular views. While Single Family Residences make up most of the current market, there is also a decent selection of condos and townhouses for sale. 3 Beds | 2.5 Baths | 1980 sq. Ft.
4 Beds | 2.75 Baths | 2470 sq. Ft.
5 Beds | 2.75 Baths | 3330 sq. Ft.
5 Beds | 2.5 Baths | 3083 sq. Ft.
5 Beds | 2.75 Baths | 3250 sq. Ft.
4 Beds | 2.25 Baths | 3600 sq. Ft.
4 Beds | 2 Baths | 2040 sq. Ft.
5 Beds | 3.75 Baths | 4435 sq. Ft.
5 Beds | 4.5 Baths | 6400 sq. Ft.
2 Beds | 2.5 Baths | 1950 sq. Ft.
3 Beds | 1.75 Baths | 1610 sq. Ft.
3 Beds | 2.5 Baths | 2130 sq. Ft.
4 Beds | 2.5 Baths | 2620 sq. Ft.
4 Beds | 2.5 Baths | 1940 sq. Ft.
3 Beds | 1.75 Baths | 1210 sq. Ft.
2 Beds | 1.75 Baths | 1600 sq. Ft.